Assassination is a sudden, usually unexpected act of murder committed for impersonal reasons, typically with a political or military leader as its target. Although assassination gained its name from that of a fanatical Near Eastern sect in the Middle Ages, the practice of assassination goes back to ancient times, and extends to the present day. At one time, the most widely used tool for assassination was a knife or dagger, whereas modern assassinations more often use guns or bombs, while poisons have long been a means of political killing. The first significant assassination victim was probably the Egyptian pharaoh Amenemhet I, who established the Twelfth Egyptian Dynasty in 1986 B.C. Amenemhet gained his power by an act of usurpation, thus perhaps setting an example for a group of courtiers who conspired in his killing. Six centuries later, Horemhab, a general who competed with the grand vizier Aya for the hand of Tutankhamen's widow (and hence for the political legitimacy to be gained by marrying a queen), was likewise a victim of assassination—in this case, by his rival. The list of assassination victims in ancient times is far too long to recount in detail. Roman history alone is studded with acts of murder. Long before and after the most famous assassination in Rome's history—that of Julius Caesar in 44 B.C. —the dagger proved a far more common instrument of political change than the ballot. The assassination of Domitian in A.D. 96, and that of Commodus in 192, serve as virtual bookends to the golden age of the empire, after which the western portion fell into a slow, but steady decline. During the half-century that began in 235, no fewer than 20 men held and lost the seat of Roman power, more often than not at the hands of assassins. Assassination plots, or rumors of them, have sometimes had the effect of neutralizing a ruler indirectly. Some of the greatest and most despicable men of ancient times—Hannibal on the one hand, and Nero on the other—killed themselves rather than let assassins do the job. And Chandragupta, founder of the Mauryan empire of India in the third century, feared assassination so much that in 301 he left his throne, joined the Jain sect, and later died of starvation. A gunman wearing an Egyptian uniform fires an automatic Kalashnikov submachine gun into a military parade reviewing stand during an attack that took the life of Egyptian President Anwar Sadat and five others at a Cairo suburb in 1981. U.S. Special Forces assigned to guard Afghan President Hamid Karzai look for targets after an assassination attempt on Karzai as he was leaving the former governor's mansion in September, 2002.
still bears the name of his dynasty, commenced the building of the Great Wall, and established an empire that would continue for more than two thousand years. The cult of the Assassins. Assassinations continued throughout the Middle Ages in western Europe and the Byzantine empire, as well as in the Muslim caliphates. It was in the Islamic world, in fact, that the first true assassins appeared on the stage. The Crusades created the political framework in which the cult of the Assassins, led by the Iranian Ismaili Hassan-i-Sabah, gained their infamous reputation, but Hassan founded the sect in 1090, a decade before the first crusaders arrived in the Holy Land, and throughout their existence, the Assassins were more apt to target Seljuk Turkish leaders than Christian invaders. Two centuries later, Marco Polo, known for his tendency to weave fantastic tales, created a legend still believed by many today. According to Marco, Assassin leaders would ensure their men's loyalty by drugging them and taking them to a garden where they could enjoy all manner of earthly delights—pleasures which, they were told, would await them in the afterlife if they died on the field of battle. Contemporary Ismaili sources, however, contain no mention of the "Garden of Paradise." On the other hand, it is true that the word assassin comes from hashshash, or "one who chews hashish"—a reference to the Assassins' use of the drug. Hassan was known as the "Old Man of the Mountain," a title that passed to each successive Assassin leader. Operating from a castle in a valley stronghold, the Assassins conducted acts of terrorism and political killing throughout the Muslim world, but particularly in Iran and Iraq. Because the Seljuks happened to be in power at that time, they were the primary target, and all attempts to uproot the Assassins proved fruitless. During the Crusades, Assassins in Syria terrorized both Turks and Christians, but combined attacks by the Mongols and Mamluks in the mid-1200s brought about the end of the sect. Assassination in modern times. If the roster of ancient and medieval leaders killed by assassins was too lengthy to recount in any detail, such is true many times over where the modern world is concerned. Abraham Lincoln in 1865 became the first American president killed by an assassin's bullet, followed by three others: James A. Garfield in 1881, William McKinley in 1901, and John F. Kennedy in 1963. Franklin D. Roosevelt, Harry S Truman, Gerald Ford, and Ronald Reagan were all targets of unsuccessful assassination attempts. The roster of political murders in the twentieth century is lengthy. The assassination of Austrian Archduke Francis Ferdinand in 1914 precipitated World War I, and the attempted assassination of Adolf Hitler by his generals 30 years later very nearly ended World War II. Not only Mohandas K. Gandhi in 1948, but Indian Prime Minister Indira Gandhi (no relation) in 1984, and her son and successor, Rajiv Gandhi in 1991, fell victim to assassins' bullets. Leaders on both sides in the Middle East have been killed by assassins: King Abdullah of Jordan in 1951, President Anwar Sadat of Eygpt in 1981, and Israeli Prime Minister Yitzhak Rabin in 1995. Interestingly, each of these leaders was killed by extremists on their own political side. On the other hand, extremist leaders are as likely as any to become targets of assassins. Senator Huey Long of Louisiana in the 1930s, and Malcolm X 30 years later, both fell to assassins' bullets. So too did George Lincoln Rockwell, leader of the American Nazi Party, and Pim Fortuyn, founder of a radical anti-immigrant party that stunned the Dutch electorate by finishing second in the 2002 parliamentary elections. Targets of assassination are not necessarily national leaders, formal office-holders, or even political leaders. When a Turkish assassin attempted to shoot Pope John Paul II in 1981, it was clearly a political act even though the pope is not a political leader per se. Martin Luther King and Robert Kennedy, both assassinated in 1968, were political leaders, but King held no formal office and Kennedy, although he was a senator and presidential candidate, symbolized a larger cultural atmosphere of optimism and activism. Furthermore, his status as John F. Kennedy's brother added greatly to the symbolic impact of the event. Many of the assassinations mentioned in the preceding paragraphs were public acts, committed in crowded areas where the loud crack of a fired gun served as a signal of a murder in progress. Assassination committed by modern security organizations and other government-controlled response teams, however, is of a quite different nature. Indeed, assassination, whether undertaken by governments, nongovernmental organizations, or individuals acting alone, is most effective when performed in stealth. Such was the case with an act of political murder that occurred at the outset of the modern era, during the French Revolution. As depicted in a famous painting by Jacques-Louis David, the radical leader Jean-Paul Marat was in one of the most vulnerable places—his bath—when young Charlotte Corday, a supporter of the opposition Girondists, caught up with him on the night of July 13,1793. Corday entered Marat's private chambers under the pretense of being a journalist there to conduct an interview. More than two centuries later, the Muslim terrorist organization al-Qaeda used exactly the same pretext to gain an audience with Ahmad Shah Massoud. The leader of the rebels in the Northern Alliance, and widely regarded as the most popular opposition figure in Afghanistan, Massoud posed the principal threat to the ruling Taliban, who provided asylum to al-Qaeda and its leader, Osama bin Laden. 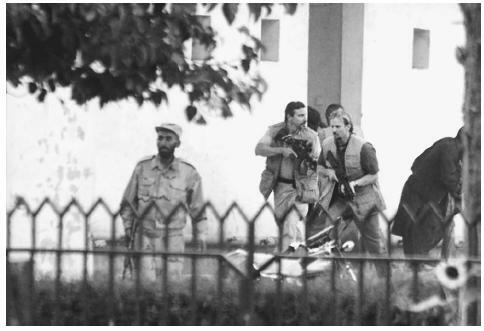 Two Arab al-Qaeda operatives, posing as journalists with a camera, met with Massoud in private on September 9, 2001—just two days before al-Qaeda launched its infamous terrorist attacks on the United States. 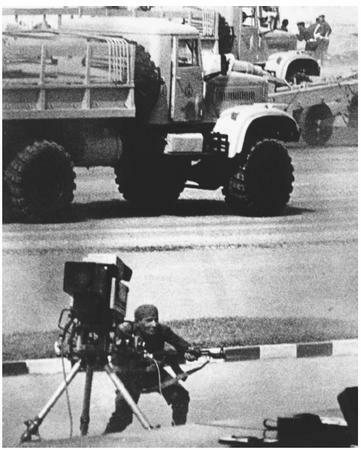 As the interview began, their "camera" exploded, killing both Massoud and the two assassins. SMERSH and Trotsky. An excellent example of stealth assassination undertaken by operatives working for a modern government was the assassination of Leon Trotsky in Mexico City in 1940. Trotsky had long been a rival of Josef Stalin, who recognized that Trotsky's role in launching the Bolshevik takoever of Russia alongside V. I. Lenin gave him much greater revolutionary legitimacy. Stalin had Trotsky exiled, but still wanted him dead. For more than a decade, agents of SMERSH ( SMERrt SHpionam or "Death to Spies"), the KGB assassination team, tracked him. The individual who finally gained Trotsky's confidence was Ramón Mercader, whom Trotsky granted a private interview. Unbeknownst to Trotsky, however, Mercader had been recruited by SMERSH in Spain during its civil war. Using the cover identity of Jacques Mornard, a French journalist, Mercader had gradually worked his way into Trotsky's inner circle, in part by seducing an American named Sylvia Agelof, who had close connections to the radical leader. Mercader worked patiently, meeting Trotsky on several occasions before mentioning that he had written a paper on Trotsky's political philosophies, and wished to have the master himself read it. Undoubtedly flattered, Trotsky agreed to meet with him on August 20, 1940. On the appointed day, Mercader arrived bearing the putative manuscript—which was actually gibberish—along with the concealed tool necessary for his mission: a 13-inch dagger, a pistol, and an Alpine mountain climber's ice ax. After Trotsky began to read the manuscript and realized that it was only a prop, he looked up at his guest, whereupon Mercader split his skull with the ice ax. Trotsky did not immediately die, and prevented his bodyguards from killing Mercador because "He has a tale to tell." Within 24 hours, Trotsky was dead in a hospital room, and Jacques Mercador was in the custody of police. Mercador maintained his false identity as Mornard throughout his trial, where he claimed that he had killed because he was jealous that Sylvia had an intimate relationship with Trotsky. Sentenced in 1943, Mercador served 17 years in a Mexican prison. After his release, he went first to Prague and then to Moscow, where the Kremlin awarded him the Order of the Soviet Union. Wrath of God and "Black September." Another instructive example of a government undertaking a careful and calculated plan of assassination is that of Israel in response to the murder of 11 Israeli athletes at the 1972 Summer Olympic Games in Munich. The killing had occurred at the hands of Black September, a terrorist group established by the Palestine Liberation Organization (PLO) as a "deniable" action team—in other words, a group that could not be conclusively tied to its sponsors. In seeking to mete out justice to Black September, Israel in turn set up its own deniable counterterrorist unit, known as the Wrath of God. Between 1972 and 1974, Wrath of God (nicknamed "Israel's long arm") allegedly killed more than a dozen Black September operatives. Wael Zwaiter, for instance, had the misfortune to find himself in a Rome elevator with what turned out to be two Wrath of God agents carrying. 22 caliber pistols. The group killed Mahmoud Hamshari with an explosive device on a telephone in Paris, and claimed Hussein Bashir in Nicosia, Cyprus, with a bomb under his mattress. An explosion also claimed Mohammed Boudia, who, after a night with his girlfriend in her Paris flat, started his automobile, only to discover too late that it had been rigged with a car bomb. As efficient as the Wrath of God was, it made some mistakes. In Lillehammer, Norway, in 1974, Wrath of God operatives shot a man they believed to be Ali Hassan Salameh, operations chief of Black September. In truth, he was Ahmed Bouchiki, a Moroccan waiter carrying an Algerian passport. Five years later in Beirut, the Wrath of God finally eliminated Salameh with an explosive device. In the meantime, the Lillehammer incident provoked complaints from western European nations vexed at the Israelis for using their cities as hunting grounds, and Israel agreed to shut down the Wrath of God. CIA. It is a truism of historically alleged assassinations carried out by the Central Intelligence Agency (CIA), and other such organizations in the United States that the only operations of which the citizenry ever learns would be the botched ones. Such is the situation of an agency dedicated to covert action under the aegis of a government with a degree of openness before its polity—a problem with which SMERSH, for instance, did not have to contend. The CIA has been publicly embarrassed by revelations of attempts to kill Fidel Castro by a number of fanciful means, such as poisoning his cigar. There have also been allegations that the agency either undertook or supported the assassinations and attempted assassinations of numerous world leaders from Chou En-Lai of China in the 1950s to Saddam Hussein in the 1990s. These and other revelations, many of which emerged during the 1975–76 hearings led by Senator Frank Church (D-ID), helped bolster an atmosphere of public suspicion toward the CIA and NSA. From the 1970s onward, popular conspiracy theories emerged among the public that linked the CIA to almost every political slaying around the world, including the assassination of President Kennedy. Conspiracy theories aside, some trained CIA operatives possess extraordinary skill in assassination techniques. Some of those techniques are discussed in a CIA assassination manual, apparently written in the 1950s and released to the public in 1997. Lentz, Harris M. Assassins and Executions: An Encyclopedia of Political Violence, 1865–1986. Jefferson, NC: McFarland, 1988. McKinley, James. Assassination in America. New York: Harper & Row, 1977. Sifakis, Carl. Encyclopedia of Assassinations. New York: Facts on File, 1991. Spignesi, Stephen J. In the Crosshairs: Famous Assassinations and Attempts. New York: New Page Books, 2003. Doyle, Kate, and Peter Kornbluh. CIA and Assassinations: The Guatemala 1954 Documents . George Washington University. < http://www.gwu.edu/~nsarchiv/NSAEBB/NSAEBB4/ > (January 30, 2003).